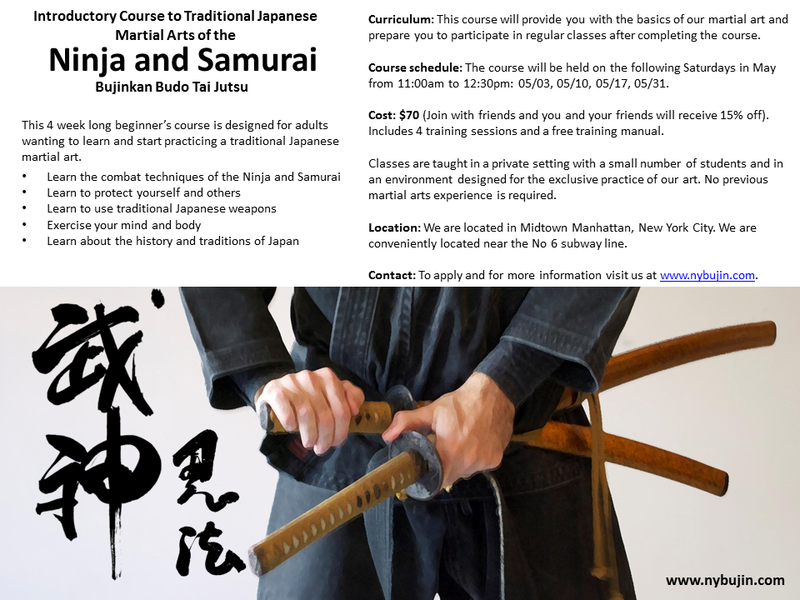 This 4 weeks beginner’s course is designed for adults wanting to learn and start practicing a traditional Japanese martial art. Curriculum: This course will provide you with the basics of our martial art and prepare you to participate in regular classes after completing the course. Course schedule: The course will be held on the following Saturdays in May from 11:00am to 12:30pm: 05/03, 05/10, 05/17, 05/31. Cost: $70 (Join with friends and you and your friends will receive 15% off). Includes 4 training sessions and a free training manual. Classes are taught in a private setting with a small number of students and in an environment designed for the exclusive practice of our art. No previous martial arts experience is required. Location: We are located in Midtown Manhattan, New York City. We are conveniently located near the No 6 subway line. Contact: To apply and for more information visit us at www.nybujin.com and use our contact form. Marvelous website, thank You ! !